No, thankfully I was supported by the Dave Rayner Fund during the 2017 season. I have always loved cycling and have been riding since the age of four. I just loved riding my bike. When I was nine I joined Team Darenth Cycling club where I fell in love with the sport even more. I started racing cyclocross at age twelve then progressing to road as a Junior. I completed my A levels a year early, meaning I had a year in which I wanted to try riding full time. I began working with a coach leading into the season of 2016 - riding for [email protected], at this point I realised I had some potential. I am now giving cycling everything and am excited to see where my wheels will take me. For 2018 I’m staying with Goma Dakwerken. The family feel and support they provide is amazing. It’s a great environment to achieve my goals! The Team competes in the Beker Van Belgie League. We were ranked 9th at the end of the year. As a team, we are really motivated to improve on this! The team manager and staff are really supportive of the riders. From standing in the rain to driving 6 hours across Northern France to race, they are always there to help us! The team races in predominately in Belgium, but we also compete in France. Last year I was selected to race the Tour De La Manche in Brittany. It was my first race in France and I gained valuable experience. I would love to have the opportunity to race it again! 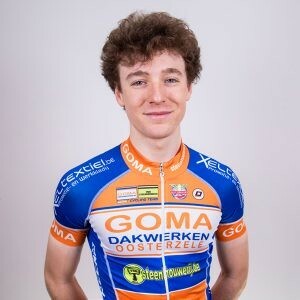 Goma does two stage races in Belgium through the season: Vlaams-Brabant and Ronde Van Oost Vlaanderen. I have competed in Oost Vlaanderen twice and can’t wait to give it another crack! The team will compete in 27 races throughout the year. So there are plenty of opportunities to get some results! I will be living in Zottegem, East Flanders. It is situated between the Walloon and West Flanders. So training is perfect. I can ride into the hills or flatter lands to meet all training needs. The team kit is provided by Doltcini sportswear. We are sponsored by Bottecchia bikes. This year I will be riding the T1 Endurance which is a new bike in their range. I am really excited to give it a try! Goma is a building company that is based in the local area and well known. When out riding, I will often get a supportive car beep and a wave. It is lovely to have the support of the locals. The house is just out of town in the rolling countryside. The garden has a picturesque lake, which, in summer is nice to swim in. There are a handful of quintessential village bakeries which make delicious fresh bread, along with supermarkets to get the rest of the shopping. Photography is my second passion. I also want to study Economics and learn Flemish during my stay.